Work continued this week on the flying life extension programme, with the leading edge strengthening panels being secured to both wings. 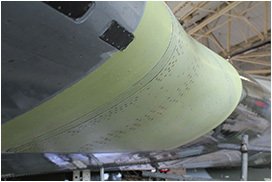 At the time of writing, riveting of the starboard side is complete, with the heads of the rivets now milled down flush. By this time next week, we hope to be in a position to prepare for paint priming, with our painter Steve Hands on call ready to start applying the gloss surface finish. Look out soon for a full report on what it has taken to achieve this modification from Sam Evans. He has been responsible for overseeing this vital part of the winter engineering work. Without it and your superb financial support, XH558 would by now be a static or fast taxying exhibit, rather than a living, breathing, flying machine! 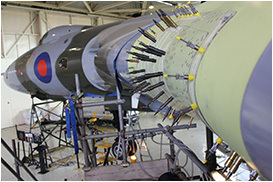 Earlier this week, we released a short video showing how the complex 3D shapes were manufactured over the purpose-built moulding formers developed from the scanned images of XH558’s wings.